at the Greenville Convention Center in Greenville, North Carolina. In November 1974, a group of information technology (IT) professionals from the University of North Carolina (UNC) system met to discuss the creation of a network of professionals to share applications across campuses. Aligning with the National College and University System Exchange (CAUSE) initiative, the group of 28 people representing 12 institutions of the UNC system created the UNC CAUSE organization to facilitate cooperation, information exchange and technology leverage. More than 40 years later, UNC CAUSE remains a thriving network of IT professionals from the 16 campuses of the UNC system. Among the organization’s many goals and activities, the primary focus is the annual UNC CAUSE conference. NC State’s own Associate Director for Outreach, Communications and Consulting in the Office of Information Technology (OIT) Sarah Noell has been involved with UNC CAUSE since 1989 and served as president of the organization in 2017. The three-day event currently averages 400 attendees and 60 corporate partners. 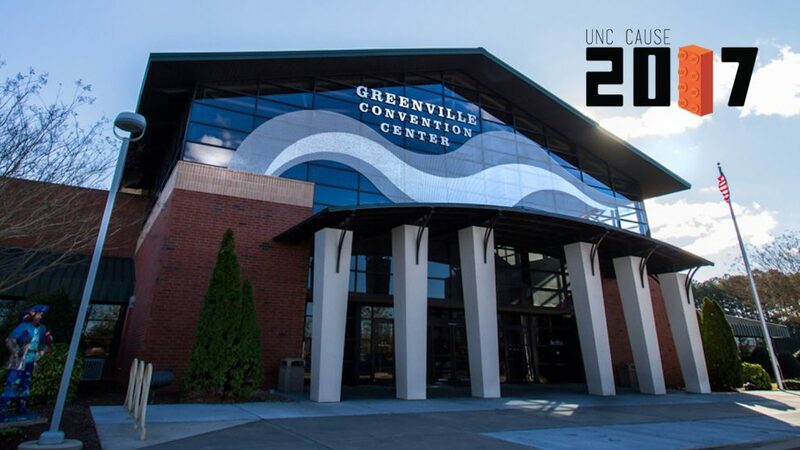 The 2017 conference was held October 2–4, 2017, at the Greenville Convention Center in Greenville, North Carolina. Each year, the conference is planned by a different group of UNC system schools distinguished by western, eastern and central regions. The 2017 conference was planned by the western region and featured six tracks including Customer Support and Engagement, Infrastructure and Operations Management, Innovation, Leadership and Professional Development, Security and Compliance, and Teaching and Learning with Technology. “Program chairs work hard to make sure every institution in the UNC system has a presentation at CAUSE for sharing and discussing what they are doing,” said Noell. This gives each institution an opportunity to learn from one another and solve similar issues. Staying true to its mission, the UNC CAUSE conference provides a welcoming environment for participants from across the UNC system to give a presentation for the first time. Web Services Coordinator in OIT and conference co-chair Jen McFarland noted the significance of attending and presenting at UNC CAUSE early in her career. She explained the guidelines for presentation proposals are less stringent and are mostly based on knowledge and information sharing. Now as conference co-chair and a seasoned presenter, she encourages and supports her own staff members in giving presentations. This year, DELTA’s Emanuel Brunson presented for the first time at the UNC CAUSE conference. With his colleague Allie Giro, Brunson spoke about leveraging support and training to prepare faculty for the online classroom. “I got the confidence and backing from my team, but I also felt like there was something that we needed to share,” said Brunson. He added the UNC CAUSE conference is a great platform and encouraging environment because you are talking to your peers from across the UNC system. Brunson said he would definitely encourage others to present because everyone has something to offer and knowledge to share. “Someone in another department or university may be dealing with something similar, but now they understand they are not the only ones going through the same situation,” he added. Brunson also noted the benefits of attending the conference with colleagues as a good team-building exercise and a way to learn more information by attending different sessions and then sharing with each other. In addition, he said it is beneficial to meet others from across the UNC system to share information and build partnerships for future projects. The partnerships and conversations started at the UNC CAUSE conference are encouraged to continue throughout the year with the recent development of UNC CAUSE-supported Special Interest Groups (SIGs). McFarland said the SIGs were introduced to provide ongoing professional development and opportunities throughout the year. While UNC CAUSE is an IT conference, the variety of sessions and attendees makes it a conference for any professional involved with teaching and learning with technology. For DELTA, this means a place to share instructional design, training and support best practices. Noell explained after the UNC Teaching and Learning with Technology (TLT) Collaborative stopped holding a conference, the UNC CAUSE conference saw a jump in proposals with an instructional technology focus and worked to provide a forum for these types of presentations. “We have expanded and added a TLT track since so many of the IT professionals are involved with online and faculty design/instruction on their respective campuses,” she said. With this expanded focus, the UNC CAUSE conference now attracts instructional designers like Jakia Salam who specializes in online course design. Salam and Angie Smith, teaching associate professor in the Department of Educational Leadership, Policy, and Human Development, gave a presentation on using tools to make videos interactive and engaging. The pair had worked on a DELTA Grant together and created a presentation to show how they incorporated videos into Smith’s online counseling course. Smith was a first-time attendee of the conference and spoke highly of its benefits. In addition to connecting with DELTA colleagues, Smith enjoyed learning innovative strategies and tools from instructional designers from around the state. “As a faculty member, learning best practices from marketing specialists, instructional designers, graphic designers and so many talented colleagues enables me to conceptualize my own courses from multiple perspectives,” said Smith. However you may be leveraging technology, the UNC CAUSE conference provides a place to learn, grow and participate. With a registration fee of only $95 and a location in North Carolina, the UNC CAUSE conference is truly a valuable resource and a great place to present your work, hear what others are doing across the UNC system and network with colleagues in higher education. Visit the 2017 UNC CAUSE schedule to view presentations from other DELTA staff including Christopher Beeson, Yiling Chappelow, Marty Dulberg, Suzanne Edmonds, Stacy Gant, Bethany Smith and Bethanne Tobey.